For the peas, place 260g frozen peas in a pot of boiling water, about 3 minutes. Strain the peas and combine with a few glugs of olive oil, 1 peeled and minced garlic clove (optional), and the zest and juice of 1 lemon. Season with salt and freshly ground black pepper to taste. Lightly mash the peas with a fork. For the pork, rub a 375g pork fillet with a large handful chopped fresh sage and drizzle with olive oil. Season with salt and freshly ground black pepper to taste and fry the pork fillet in a pan over medium-high heat, turning regularly, about 15 minutes in total. 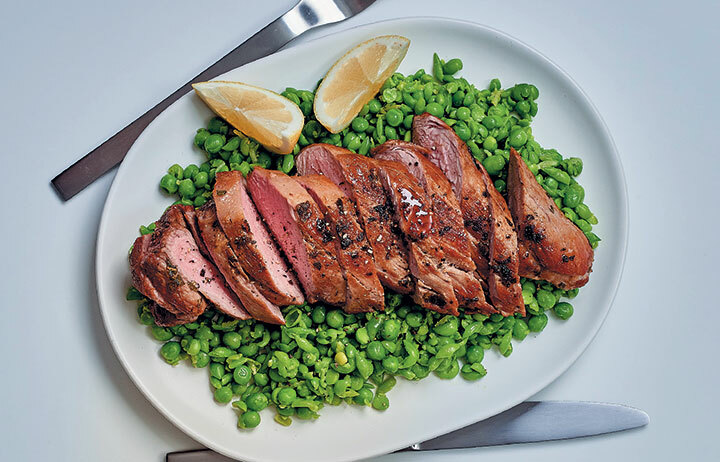 Warm the mushy peas in the microwave and spoon onto plates, then top with slices of the pork fillet and serve with lemon wedges alongside for squeezing, if desired.